Wow, we love the photos! Really enjoyed looking through them and remembering our day. I was very excited about this wedding as it was in many ways a first. 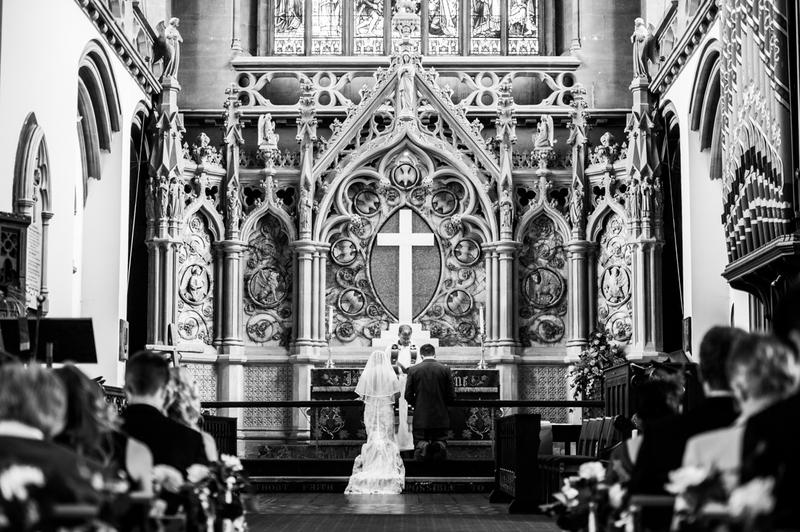 Firstly I have not photographed a wedding ceremony in St Saviours in Larkhall before and – wow! – did this church not disappoint! And the priest started his sermon with a set of pretty funny jokes, who would have expected that. Secondly Grace and Tim celebrated at beautiful Priston Mill (in the water mill) so that ticked all the boxes for a fabulous and well organised wedding venue. Grace looked stunning, we took one of the best bride/groom/bridesmaids/ushers shots to date (the jumping shot, look at the faces) and the groom had a gun put to his head at some point. I did not get bored! Congratulations Grace & Tim! If you are planning to get married at Priston Mill or another another venue in the South of the UK and you are still looking for a relaxed and creative wedding reportage photographer, please don’t hesitate to contact me to find out a bit more about me and my approach to wedding photography. I offer totally non-binding meetings to all couples to give the opportunity to ask me questions, look at more photographs and talk through the order of the day. So if you are interested, please get in touch.